Buffers shown here are not lane widths, but represent the operating envelope and minimum distance to adjacent objects when in motion, and can overlap with adjacent lanes. The width of vehicle lanes affects street safety and travel speeds. Narrower lanes generally result in slower travel speeds while increasing street safety for all users. For private motor vehicles in particular, narrower lane width, down to 10 feet or narrower in special cases, is correlated with all-user safety benefits. Lane widths are determined in the context of both the design vehicle, or the regular user, and the control vehicle, or the infrequent but largest user. 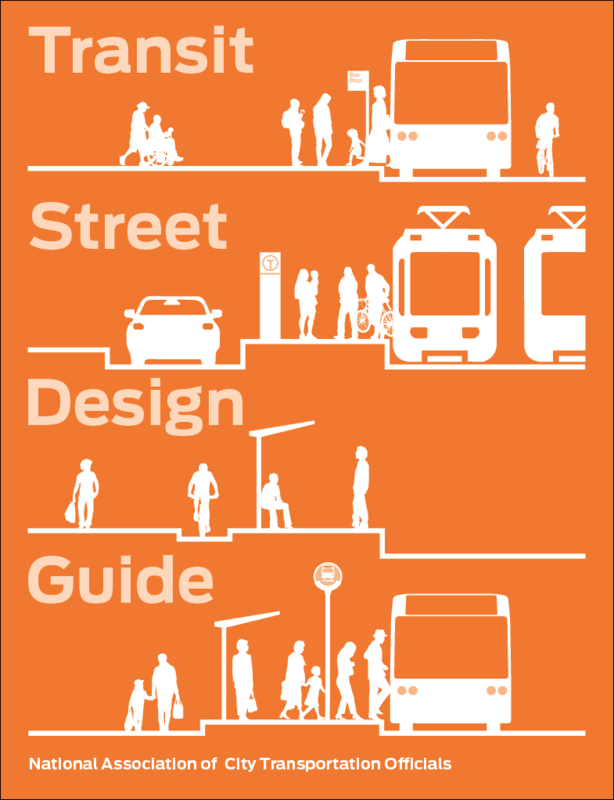 The design vehicle uses one lane, while the control vehicle may intermittently require the use of multiple lanes (refer to the Urban Street Design Guide for additional information). On many transit streets, the transit vehicle is both the design and control vehicle—both the regular and largest user. Vehicles have both clearly defined vehicle spaces (the size of the vehicle itself) as well as a buffer space (or operating space) which defines the space needed to operate comfortably at a moderate speed. 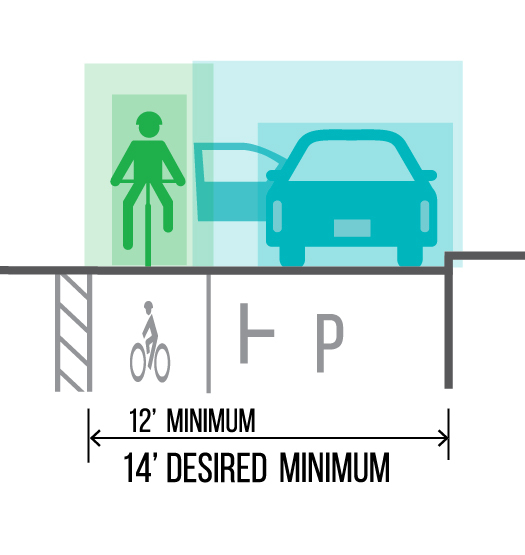 Wider vehicles can be accommodated in narrower lanes on an infrequent basis—even where street space is constrained, vehicles may on occasion use a part of an adjacent lane where the whole street section provides enough space to do so safely. Overlapping buffer zones can be safely accommodated at slower speeds. Buses are among the largest vehicles operating on city streets, with mirror widths often exceeding available lane space. Where buses operate in a narrow mixed-traffic lane, intrusion into adjacent lanes may sometimes occur, such as when two buses pass each other. Ensure that adjacent lanes in a street section can occasionally accommodate such movements when needed. Encouraging safe transit movement while accommodating efficient operations requires a predictable, even, and low-speed environment. Narrower transit lanes that are co-implemented with signal and intersection treatments, in-lane stops, appropriate stop spacing, and adjacent buffer zones, allow transit to progress comfortably at consistent speeds. While transit vehicles in constrained spaces are sometimes subject to mirror strikes, wider mixed-traffic lanes can increase the number and severity of total crashes in which transit vehicles are involved. Where buses use a travel lane adjacent to a bicycle lane, both bus and bike operational comfort are enhanced by providing a buffer space between them where width is available. Vulnerable users like bicyclists should always be given sufficient space to operate safely at a comfortable distance from fast-moving traffic or from larger vehicles like buses and trucks, outside of the door zone. Design for rail vehicles must factor dynamic vehicle envelopes, critically around turns and elevation changes. Vehicles on a fixed guideway cannot move around obstructions. On streets with existing vehicle speeds above 35 mph, it may be necessary to introduce narrower lanes along with other design measures to lower vehicle speeds to a safe level for transit and pedestrians, or to fit a dedicated transit facility. 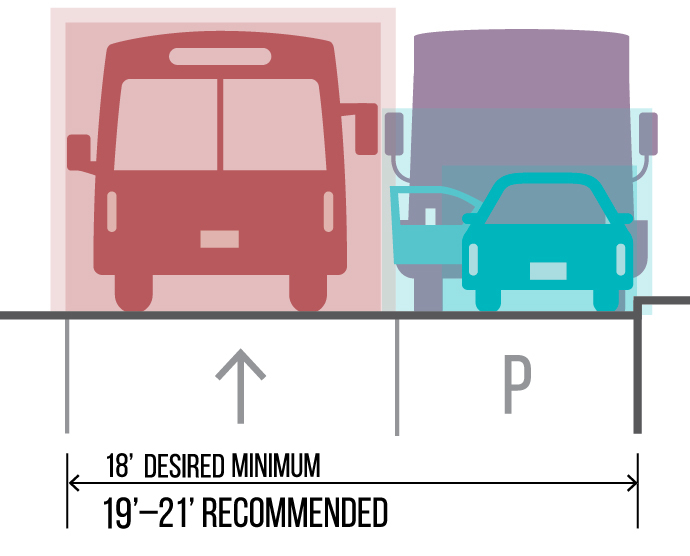 Lane width considerations for specific facilities are included in Transit Streets. 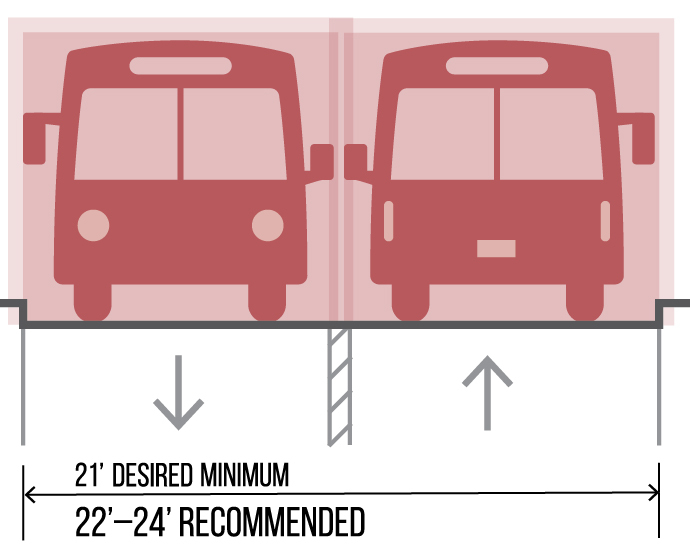 Bus lanes may be 10–11 feet wide when offset, and 11–12 feet when configured curbside or in transitway adjacent to an opposing lane of bus traffic. Where space is available, use buffers rather than widened lanes to reduce side-swipe risks without increasing design speed. In mixed-travel lanes, assign added width to buffer zones to visually narrow lanes. 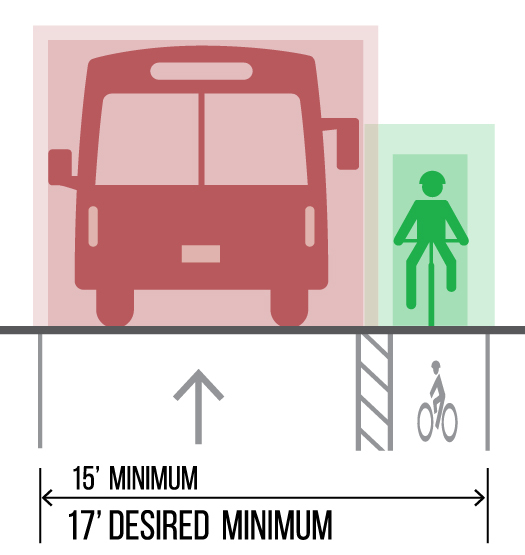 Shared bus-bike lanes may be 10–11 feet wide along segments where neither is expected to over take the other, such as where bus volumes are moderate or where bus speeds are low. Passing at stops may be accommodated with a 13-foot shared lane. 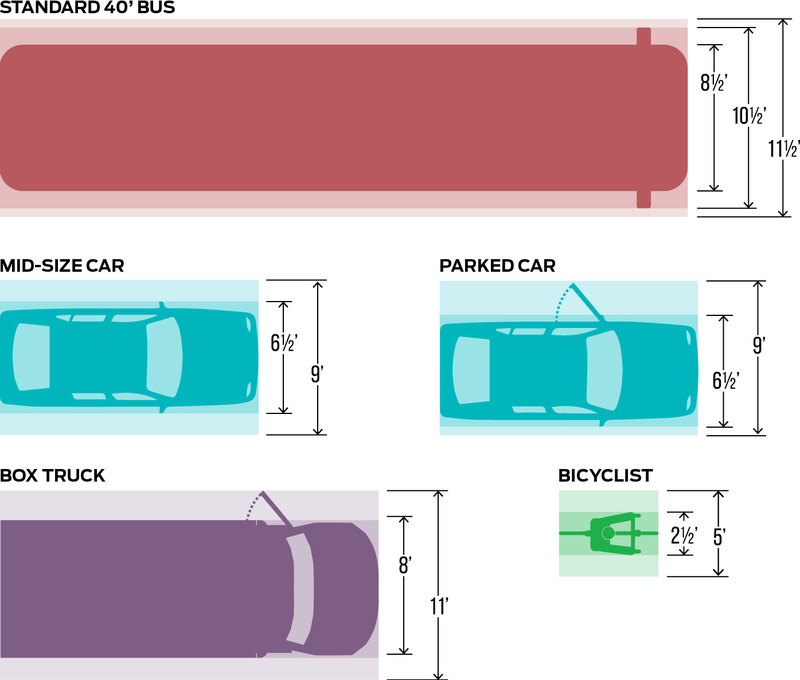 Where wide trucks commonly park or load in a parallel parking lane, potentially obstructing transit service in the adjacent travel lane, consider a parking buffer or wider travel lane. In-street rail vehicles, including streetcar/tram/trolley and multi-unit LRVs, can operate in travel lanes 10–11 feet wide, depending on vehicle model. Mirror clearance may be a more significant factor for streetcars than for buses. Guideway and vehicle operating space must remain clear of obstacles, such as wide vehicles parked in an adjacent lane. Combine these pairs of adjacent uses to configure a street, accounting on a case-by-case basis for existing space constraints and operational characteristics. The assembly of adjacent lanes should account for friction and user comfort; the buffer envelopes of users may overlap infrequently or at low speeds. Minimum widths may not provide a comfortable operating space over long distances.